Tapper Transport Ltd is an Auckland based containerised sea-freight handling and transport company. Tapper is New Zealand’s largest container transport company and also operates New Zealand’s largest container freight station. With a fleet of 45 trucks Tapper now carries over 90,000TEU of imports and exports a year. In addition to trucks Tapper operate, with KiwiRail, a rail shuttle service. This runs twice a day, to and from the Port’s of Auckland and our Hub located within the KiwiRail-MetroPort complex at Southdown. The container freight station, also located in our Southdown Hub, is MAF approved and Customs bonded. Here we unpacked approximately 12,000 TEU’s of import cargo and pack 3,000TEU’s of export cargo last year for a wide range of customers. Innovation is at the core of our business. We are proud we are recognised as constantly setting industry direction and paving the way forward. We continue to innovate having led the way with things like our in-house award winning container management system ‘OnTap’, the installation of an engine management system in trucks that, amongst other things, provides weekly information on our trucks carbon emissions. We are currently actively investigating the introduction of Hybrid trucks. Our sophisticated software allows the business to dispatch its fifty odd vehicles electronically, track all vehicles using global satellite positioning and to produce extensive reports for our clients. The GPS system allows us to pinpoint any truck’s whereabouts in New Zealand – an important feature when carrying dangerous goods. 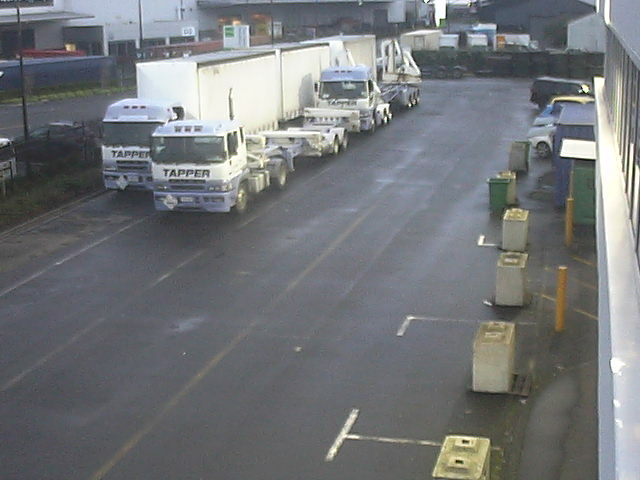 Tapper Transport’s Auckland warehousing is based in Penrose and is constituted of 92,600 sq ft of warehousing and canopies. All cargo exchange is carried out under cover. The building was purpose-built in 1994 and the premises are licensed by H M Customs and the Ministry of Agriculture and Forestry. The container storage area is sealed, video-monitored and fully fenced. It is serviced by a 42 tonne Taylor 20’/40’ telescopic container forklift. There is storage capacity for 500 full containers. Prior to April 2010, Tapper Transport was a family owned company, very proud of our growth and customer service capability. We are now pleased to be a wholly owned subsidiary of the Port of Tauranga Limited, who share our vision and culture. our customers with a seamless and efficient link in their supply chain.